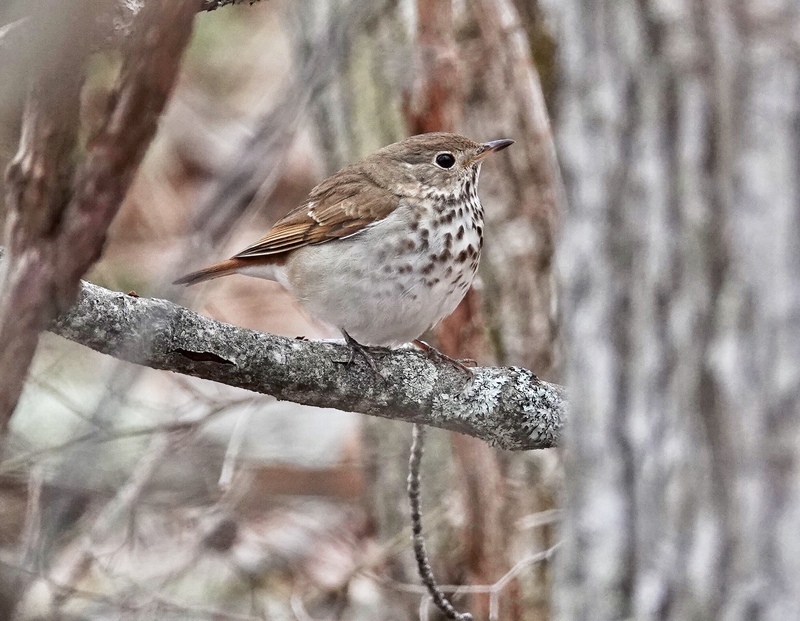 On my first really birdy day of spring 2018 in the forest of Laudholm Farms (Wells National Estuarine Research Reserve)…along with both Ruby and Golden-crowned Kinglets, Blue Jays, Robins, Crows, Northern Harrier, Kestrel, Bluebird, and Eastern Phoebe…I caught this Hermit Thrush low to the ground and between trunks. It sat there just long enough for a few pics. Of course, except for the Blue Jays, Robins, and Crows, I only saw one of each of the other species, so “birdy” day is relative to the slow start spring and migration are getting this year in southern Maine. Sony RX10iv at 600mm. Program mode. -.3EV. 1/500th @ ISO 500 @ f4. Processed in Polarr and Apple Photos.